It’s not easy walking on a prosthetic foot. Aside from the obvious difficulty of adjusting to an artificial limb, dragging around the weight of the foot exerts a lot of energy — 23% more than walking on a natural foot, to be exact. But a prototype foot developed by researchers at the University of Michigan makes it easier for amputees to move around normally by recycling kinetic energy generated while walking. Typical prosthetic feet can’t mimic the ankle’s natural push-off, which is why the limbs feel so heavy. The University of Michigan prototype, on the other hand, is able to reproduce the ankle’s strength by recycling energy produced while walking. 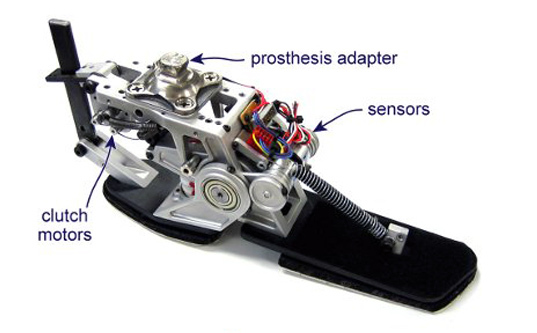 There are other artificial feet that can mimic the ankle’s push-off, but they require big batteries and motors. Since the prototype device recycles energy, it only requires a small battery that uses less than one watt of power. No word on when the artificial foot will be released commercially, but it is currently in testing at the Seattle Veterans Affairs Medical Center. An Ann Arbor-based company is also reportedly looking into producing a device based on the University of Michigan research. I liked the design of the prosthetic foot. Could you notified me when the product is available to the general public? Thank you. It's not easy walking on a prosthetic foot. Aside from the obvious difficulty of adjusting to an artificial limb, dragging around the weight of the foot exerts a lot of energy -- 23% more than walking on a natural foot, to be exact. But a prototype foot developed by researchers at the University of Michigan makes it easier for amputees to move around normally by recycling kinetic energy generated while walking.